The movie, Heaven Is for Real, opens today in theaters all across America and I would encourage everyone to go and see it. Back on July 6, 2011, I wrote about how the book, on which this film is based, impacted my wife and me, so I am reposting that account here today. Grace and peace to you all, and may your hope and assurance of a heavenly reality be rekindled and strengthened. 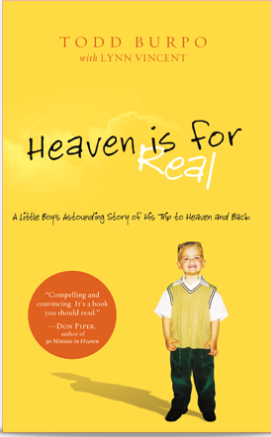 I was shopping at Costco recently when I stopped by the book section and spotted the book Heaven Is for Real, about a little boy, Colton Burpo, who underwent emergency surgery for a misdiagnosed appendicitis that nearly took his life just short of his fourth birthday. His story had been featured on several recent TV programs, so I bought the book and read it in one sitting. When Colton made it through surgery, his family was overjoyed at his miraculous survival, but they were surprised and astonished during the following weeks and months as he began to detail his extraordinary experience of going to heaven during surgery. He described leaving his body while under anesthesia during surgery, and described exactly what his parents were doing in separate parts of the hospital while he was being operated on. He described being in heaven, meeting people whom he had never met in life, sharing events that happened even before he was born, and described details about heaven that matched the Bible, even though he had never read the Bible because he had not yet learned to read. “Who told you I had a baby die in my tummy?” asked his mother. Todd and Sonja were very surprised, for two years after Sonja gave birth to Cassie, she became pregnant with a second child, but miscarried two months into the pregnancy. Eleven months later she gave birth to Colton, but neither Todd nor Sonja had ever told their son about the miscarriage, figuring that he was too young to understand. “Don’t you mean Jesus adopted her?” Sonja said. Sonja was overwhelmed to learn that the baby had been a girl, and asked Colton a number of questions, including what she looked like (answer, like Cassie, but with dark hair like Sonja’s) and what her name was. “You’re right, Colton, we didn’t even know that she was a she,” Sonja said. At this point, I paused in my reading as tears began to stream down my cheeks. I went into the living room and asked my wife, Diana, to read the four pages describing Colton’s account of meeting his sister in heaven. While Diana read the pages, I went back into my study and my tears came freely as I thought about our own experience losing two babies to miscarriages. I had been married twice before meeting Diana, and had produced two daughters from the first marriage and a son from the second. When I married Diana, she was 37 and had never been married nor had she ever had a child. She was hoping that we would have children, but I had been unwilling to have any more children. But three years later I relented and we decided to try to have a baby. We were joyful when we learned that she was pregnant and for the next two months we lived in anticipation of this addition to our family. But after these two months the baby miscarried. The cause—fibroids in the uterus. We tried again, she conceived, our hopes rose, but again the same thing happened. For the second time, Diana was devastated by the news, and mourned the losses for months. “You did? I don’t remember. What were their names?” I asked. What was it about reading Colton’s experience meeting his sister in heaven that moved Diana and me so profoundly? your workmanship is marvelous—and how well I know it. Though we had always believed that we would be united with our babies and other loved ones in heaven, reading the eyewitness account of Colton moved us emotionally and joyfully, and intensified our faith that we would some day meet and recognize our children, Katherine and Andrew. Most comforting to us is our belief that Katherine and Andrew, along with Colton’s unnamed sister and all the other named and unnamed babies are okay, for Jesus’ Dad adopted them!